Dun Karm Cini was born on the 19th of May 1938. As a priest he worked in the parishes of Mellieħa and Ħal-Kirkop in the archdiocese of Malta and in his native Żebbuġ. He served for many years in the Uffiċju Missjunarju of the Diocese of Gozo. He was also spiritual director of various Legion of Mary praesidia and of the Catholic Action Circle in Żebbuġ itself. 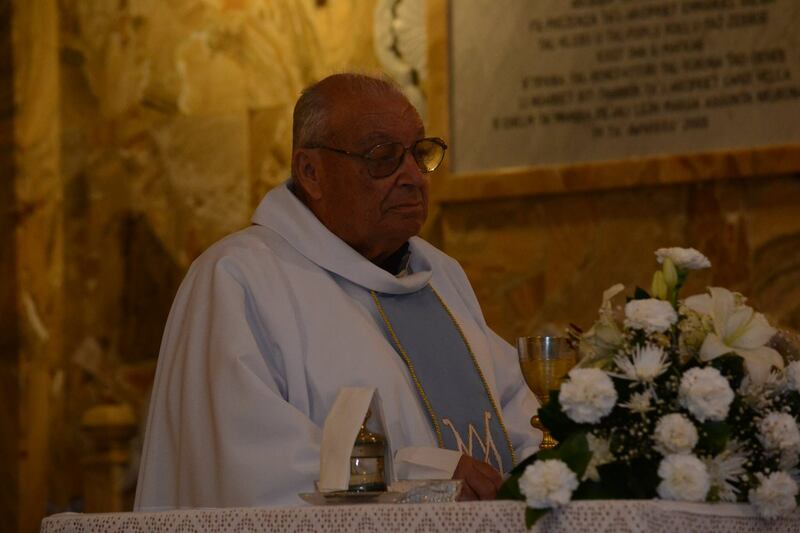 He administered the Sacrament of Reconciliaton in the Għasri parish and in the Ta’ Pinu Sanctuary for many years on a regular basis. As a member of the Collegiate Basilica of the Visitation in Għarb, he served as Cantor for many years. He was instrumental in bringing over into the Żebbuġ Parish Sanctuary the remains of holy priest Dun Karm Cachia who died back in 1950 and with whom he was acquainted. He was also Spiritual Director of the Santa Marija Band of Żebbuġ for the last decade and a half. Dun Karm died at the Mater Dei Hospital on Friday the 1st of August 2014, at about 3.00 p.m.
His funeral was held at the Żebbuġ Parish on Monday the 4th of August, Feast of Saint John Mary Vianney, Patron Saint of Priests, at 5.00 p.m. It was preceded by the singing of Vespers which was presided by the Archpriest and Collegiate Chapter of Għarb. Bishop Mario Grech presided the Mass and more than thirty priests concelebrated. His remains were later interred in the parish cemetery down the road from the parish church. He will be missed by many relatives and friends both here in Gozo, in Malta and in Australia.